Photo taken on January 10, 2008 at the site of the Widows Creek TVA coal sludge spill. 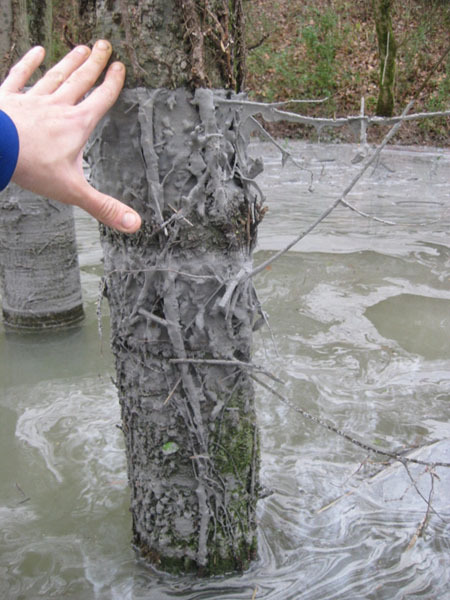 A thick, gritty coating of gray sludge on the surface of the water as well as adhering to the trees approximately 300 yards from the rupture site. The slime stretched out in a band, coating everything within 70 feet of the channel. Photo courtesy of United Mountain Defense. This page was last edited on 12 January 2009, at 13:41.